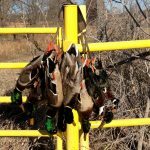 Langley – The Grand River Dam Authority is announcing that it will once again hold controlled hunts, for the upcoming deer and waterfowl seasons, on its Ottawa County properties along the Neosho River. 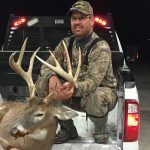 Those interested in applying for these special draw hunts, can register online at www.grda.com/grda-hunting-drawing. The registration period begins June 1 and runs through July 31. Prospective hunters can apply as individuals or with a group of up to four individuals. This year’s schedule will include a “youth-only” hunt during the youth deer gun season. 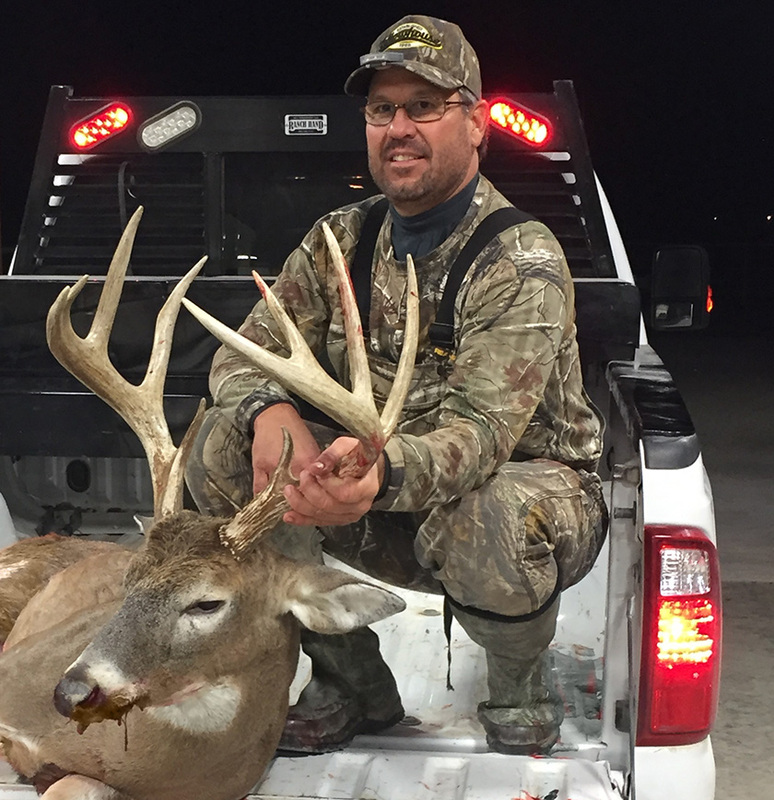 While the hunts are open to the public, GRDA also asks that residents of its municipal customer, public power communities upload a copy of a utility bill as proof of residence for consideration for special opening day hunts. 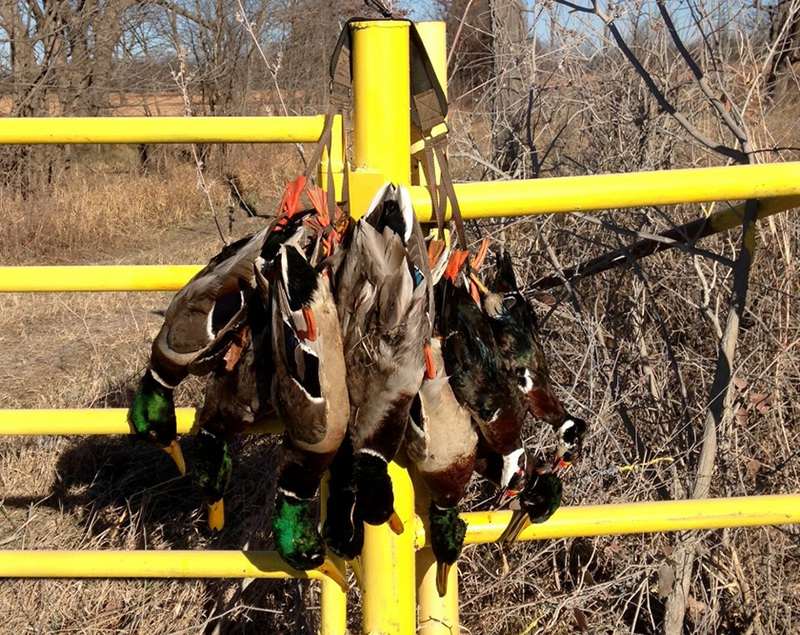 The controlled hunts for deer and waterfowl will begin this fall. GRDA Vice President of Ecosystems and Lake Management Dr. Darrell Townsend (left) accepts the National Hydropower Association (NHA) “Outstanding Stewards of America’s Waters” award from NHA Executive Director Linda Church Ciocci (center) and NHA Executive Committee President Herbie Johnson. 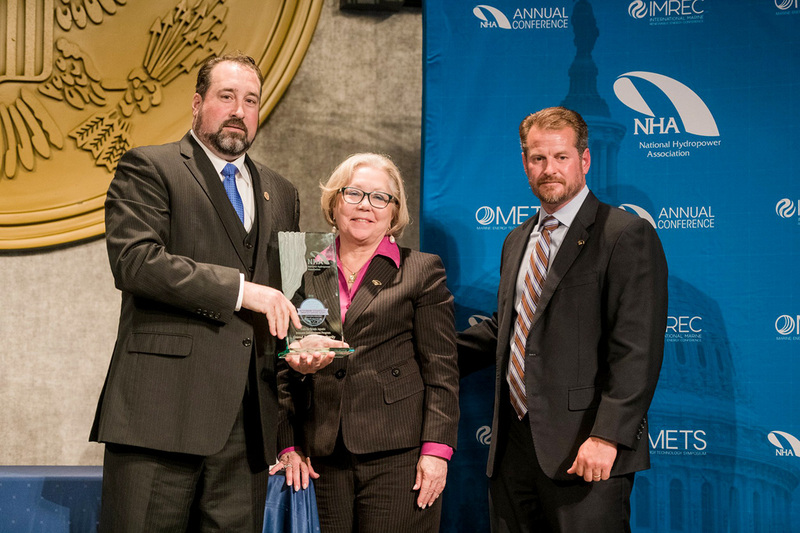 GRDA received the award for its “Rush For Brush” program, during NHA’s “Water Power Week” activities in Washington, D.C. on May 1 (photo courtesy NHA). 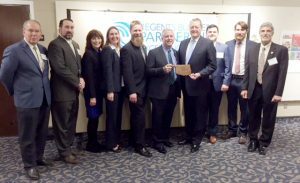 Washington, D.C. – The Grand River Dam Authority’s innovative “Rush For Brush” program, which has been a key factor in enhancing the fisheries of GRDA lake waters for over a decade, is a 2018 recipient of the National Hydropower Association (NHA) “Outstanding Stewards of America’s Waters” award. 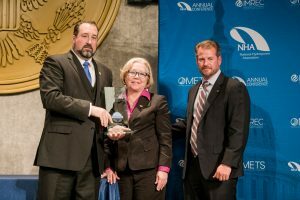 GRDA Vice President of Ecosystems and Lake Management Dr. Darrell Townsend, accepted the award on behalf of GRDA during the NHA’s “Water Power Week” activities in Washington, D.C. on May 1. According to the NHA, the award is given annually to “recognize projects that have provided extraordinary recreational, historical, environmental or educational value.” GRDA’s program was one of two recipients in the public education category. “Rush For Brush” was recognized for its value in effectively communicating and promoting the benefits of hydropower. First established in 2007, “Rush For Brush” has grown to become one of the GRDA Ecosystem Management Department’s most successful enhancement and outreach efforts. At annual program workshops (typically held twice a year), GRDA supplies the materials and volunteers supply the labor to help construct artificial fish habitats from concrete blocks and PVC pipe. Designed to protect fry and fingerlings in the water, the artificial habitats will stay in place longer than a natural brush pile in the lake. After construction, volunteers take the finished habitats and put them at a location of their choosing in the lake. To date, 5,780 habitats have been constructed by 1,100 volunteers. The habitats now cover nearly 11 acres of lake bed in GRDA-managed lakes. While improving the fisheries, the program has also helped to improve fishing opportunities. In turn, that draws more anglers to the lakes and helps to boost the area economy. Both GRDA’s Grand and Hudson lakes hosts multiple fishing tournaments each year. 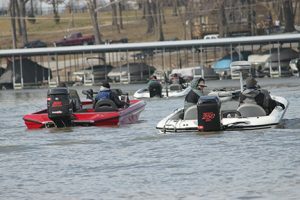 Grand also played host to the prestigious Bassmaster Classic in both 2013 and 2016. Helping our Western Oklahoma neighbors … GRDA Linemen Jason Hensley (left) and Derek Hays inspect a load of hay, loaded on a GRDA truck and set for delivery to Western Oklahoma. 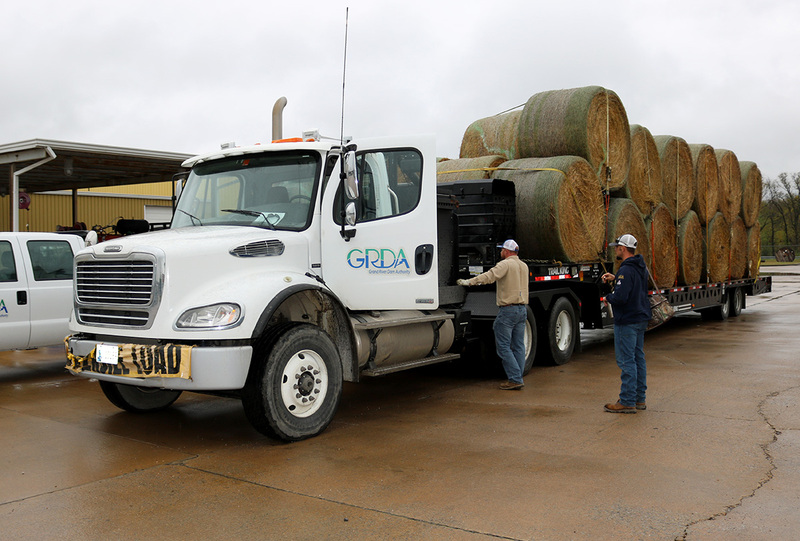 Vinita-area farmers and ranchers donated the hay and GRDA delivered it to customers of CKenergy Electric Cooperative, near Vici, Oklahoma. GRDA worked with its customer, Western Farmers Electric Cooperative, to help make the deliveries possible. Vici – Through direct or indirect sales, the Grand River Dam Authority’s electricity touches 75 of 77 counties in Oklahoma. Last week, however, GRDA’s efforts to support neighbors in those other parts of the state, went beyond the commitment in providing reliable power. Hay, donated by Vinita-area farmers and ranchers and delivered by GRDA, is unloaded near Vici, Oklahoma on Thursday afternoon (April 26). 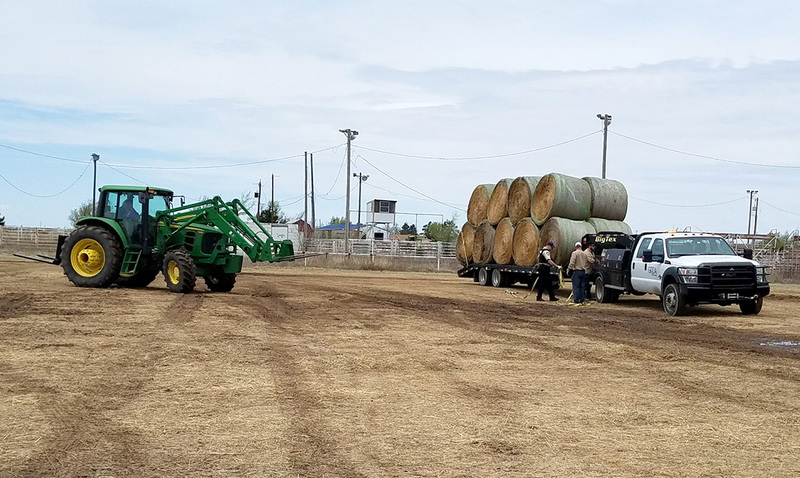 Customers of CKenergy Electric Cooperative were the recipients of the hay, in a part of the state that has been adversely affected by drought and wildfires. GRDA worked with its customer, Western Farmers Electric Cooperative, to help make the deliveries possible. 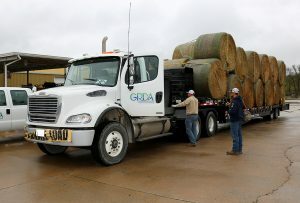 On Thursday (April 26), a convoy of three GRDA trucks delivered 59 round bales of hay to a drop-off location near Vici, Oklahoma. The hay had been donated by farmers and ranchers in the Vinita area then loaded and delivered by GRDA. Those receiving hay were customers of CKenergy Electric Cooperative (Binger). CKenergy is a distribution cooperative member of Western Farmers Electric Cooperative (WFEC), a generation and transmission cooperative that serves the electric needs of 21 member cooperatives. WFEC, headquartered in Anadarko, is a wholesale customer of GRDA. This is not the first time GRDA has worked with WFEC to help bring relief to neighbors across the state. The two electric utilities coordinated on a similar delivery effort in the spring of 2017. Headquartered in Vinita, GRDA is Oklahoma’s state-owned electric utility, funded by revenues from electric and water sales. GRDA strives to be an “Oklahoma agency of excellence” by focusing on the 5E’s: electricity, economic development, environmental stewardship, employees and efficiency. Please take notice that The Grand River Dam Authority has received an application for a private dock requiring directional bearing. Such directional bearing relates to a dock application for a private dock which if approved shall extend 134 feet across a cove, which measures 154 feet across from 745 feet mean sea level to 745 feet mean sea level on the nearest opposite shoreline. Recognition for heroic efforts … GRDA President/Chief Executive Officer Dan Sullivan (at right) and Chief of Law Enforcement Brian Edwards (left) pose with recipients of the GRDA Police Life Saving Award. Those recipients include (starting second from left) GRDA Officers Lynn Hershberger, Jeremy Cantrell, Tim Thompson and Lissa Kennedy, along with Oaks Firemen Hans Hertzler and Edwin Loco. The six were recognized for their heroic efforts during a swift-water rescue on a flooded Double Spring Creek (Delaware County) in April 2017. 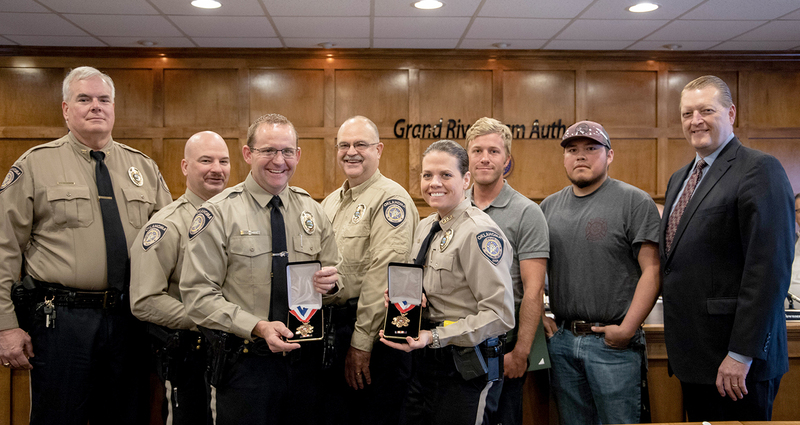 Vinita – Heroic, life-saving efforts of GRDA Police Officers and local firemen – on display during a swift-water rescue last spring – were recognized by the Grand River Dam Authority this week. 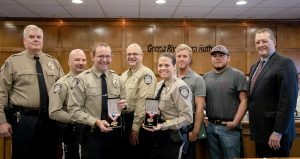 During the April 11 meeting of the GRDA Board of Directors in Vinita, Oaks Firemen Edwin Loco and Hans Hertzler, along with GRDA Officers Jeremy Cantrell, Lynn Hershberger, Lissa Kennedy and Tim Thompson, were all presented with the GRDA Police Life Saving Award for heroic actions on April 29, 2017. On that date, they were all involved in a swift-water rescue effort along the flooded Double Spring Creek, in southern Delaware County. Working together, they were able to rescue all individuals trapped in multiple vehicles in the flood waters, even after one of the rescue boats capsized, throwing the rescuers into the swollen creek. Fortunately, the swift water rescue training each individual had received was key to making sure everyone went home safely and avoiding what could have been a tragic situation. “Their training, their equipment and their quick thinking is what kept them all here today,” said GRDA Chief of Law Enforcement/Lake Operations Brian Edwards. GRDA President/Chief Executive Officer Dan Sullivan added to that, telling the GRDA Board that this situation presented challenges, with rushing water flowing over downed objects to create plenty of hazards. However, everyone went home safely at the end of the day. Langley – As activities related to the new Grand Lake “Adopt The Shoreline” program are set to begin this month, the Grand River Dam Authority is sharing more information about the program schedule and locations. 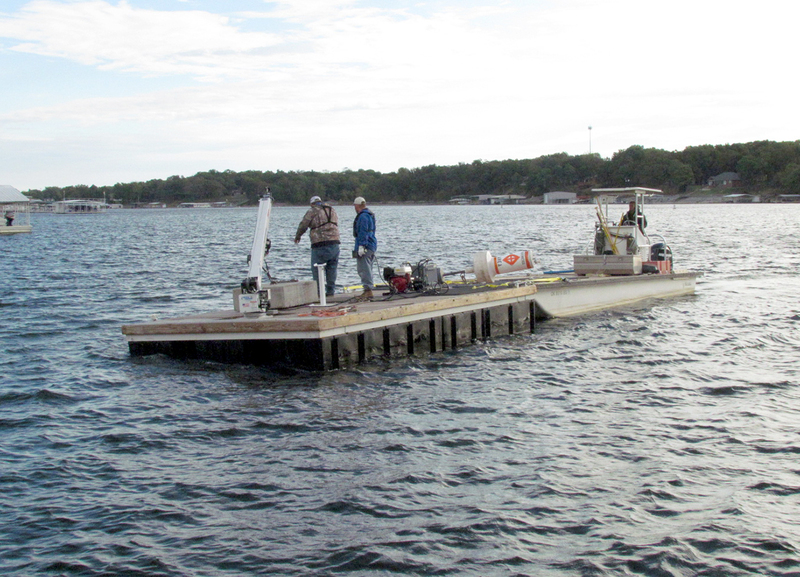 The program, resulting from a cooperative agreement between GRDA, Grand Lake Sail & Power Squadron and various grand lake stakeholders, works like this: the shoreline is divided into 10 “zones,” with a coordinator for each zone. That coordinator organizes volunteers who work together at set times to clean up their specific zone. GRDA will support the effort by supplying trash bags and will also be paying the disposal costs for all approved program cleanup events. At the same time, GRDA has also staffed its own full-time shoreline cleanup crew, complete with a barge and the necessary equipment to remove large debris form the lake shore. For more information on the program, contact GRDA Superintendent of Shoreline Enforcement Scott Horton at (918) 256 0894. You can also learn more online by visiting the program’s website at www.grda.com/adopt-the-shoreline. Pryor – The Grand River Dam Authority’s role as a reliable electricity supplier is garnering national recognition. Reliability recognition …. Linemen with the Grand River Dam Authority’s Distribution Maintenance Crew work on a project in the MidAmerica Industrial Park (MAIP). Recently, the American Public Power Association recognized GRDA for “exceptional electricity reliability” to its distribution customers in 2017. That includes GRDA’s many industrial customers in MAIP. That recognition came after APPA compiled GRDA’s reliability data and system outage data through its eTracker Reliability Service, and compared it to similar data for other utilities, as collected by the Energy Information Administration. According to those numbers, GRDA’s System Average Interruption Duration Index (SAIDI) for distribution level electric service was only 19 minutes, compared to an industry average of 129 minutes. In simple terms, that means during 2017, the length of any GRDA electrical outages for its distribution customers (the industries of the MidAmerica Industrial Park) were 110 minutes shorter than the national average for outages. “This recognition helps demonstrate public power’s commitment to reliable electric service,” said the APPA Senior Vice President of Engineering Services, Michael Hyland. GRDA President/Chief Executive Officer Dan Sullivan echoed Hyland’s comments, adding that both efficiency and reliability continue to be at the very core of GRDA’s mission. Reliability is important to GRDA customers all across its service area, including Oklahoma municipalities, electric cooperatives and the industries of the MidAmerica Industrial Park. “We appreciate GRDA’s continued commitment to reliability and responsiveness to the many companies at MidAmerica. This recognition is certainly well deserved,” said MidAmerica Industrial Park Chief Administrative Officer David Stewart. This GRDA recognition comes roughly a year after GRDA also received the “Clarence Fulkerson Electric System Achievement Award” from the Municipal Electric Systems of Oklahoma (MESO). GRDA also garnered that recognition based on the reliability of its systems, as well as its ongoing system enhancements and innovated efforts to improve municipal electric power in Oklahoma. APPA is the national trade group that represents more than 2,000 not-for-profit, community-owned electric utilities. GRDA Officers will be patrolling and enforcing the following rules, as well as applicable State laws on the state properties below Pensacola Dam. Consumption of alcoholic beverages and low-point beer will not be tolerated while operating or riding in a vehicle, motorcycle, or ATV. Operating a vehicle, motorcycle, or ATV while under the influence of alcohol or drugs will not be tolerated. Helmets must be worn by all operators AND passengers who are under the age of eighteen (18) in any off-road vehicle, or vehicle being used for off-road activities, any motorcycles, and any ATV’s. Children who are required by law to be in a properly installed and secured child seat based on age and size, and are in a vehicle with a ROPS, may be properly secured in the seat without a helmet. There are some areas of the GRDA properties that are restricted, such as immediately below the dam & spillways. Areas that are covered by Rip-Rap are also considered restricted areas, as well as areas marked by signs and barricades. DO NOT ENTER or attempt to drive in these areas. Patrons shall not cross the zones which are barricaded and marked off, or they will be subject to trespassing. Vinita – The Grand River Dam Authority has been recognized for its cooperative and innovative partnerships with Oklahoma institutes of higher education. GRDA President/Chief Executive Officer Dan Sullivan (fourth from right) holds the “Regents Business Partnership Excellence Award” along with Northeastern State University (NSU) President Dr. Steve Turner. Also in the photograph are (from left) GRDA Vice President of Scenic Rivers and Water Quality Ed Fite, GRDA Vice President of Ecosystems and Watershed Management Dr. Darrell Townsend, NSU Director of Community and Government Relations Mary Bower, NSU Associate Professor of Chemistry Dr. Jessica Martin, GRDA Watershed Ecologist Rich Zamor, GRDA Executive Vice President of External Relations Nathan Reese, GRDA Laboratory Director Steve Nikolai and NSU Assistant Professor of Education/Special Assistant to President/OSRHE Economic Council Representative Dr. Ron Cambiano. GRDA received a similar award for its work with Northeastern A&M College in Miami. On Tuesday, March 13, the Oklahoma State Regents for Higher Education (OSRHE) awarded GRDA with two separate “Regents Business Partnership Excellence” awards during a special luncheon at the University of Central Oklahoma in Edmond. GRDA received the recognition for recent initiatives with both Northeastern State University (Tahlequah) and Northeastern Oklahoma A&M College (Miami). GRDA was the only organization to receive two awards at the event. Recently, GRDA partnered with Northeastern State University (NSU) to establish a new water monitoring laboratory on campus, which will be utilized by students and devoted to water quality research along the scenic Illinois River. That partnership will also help to fund scholarships and provide in-class projects and independent research devoted not only to water quality but also animal movements on the river and enhanced bacteria research. The lab will also be utilized by NSU faculty and staff, as well as GRDA personnel. GRDA’s partnership with Northeastern A&M College (NEOA&M) began in 2016 when the two entities came together to not only increase educational and research opportunities for students but also revitalize livestock grazing and pecan-producing on properties owned by GRDA along the Neosho River in Ottawa County. Through the partnership, GRDA leases nearly 3,000 acres to NEOA&M, which in turn subleases some of the property to other agriculture interests. Revenues from those subleases help support the college’s agriculture programs. Other property is utilized as outdoor classrooms. Langley — The Grand River Dam Authority’s ongoing commitment to promoting water safety on its lakes and rivers is always a priority. 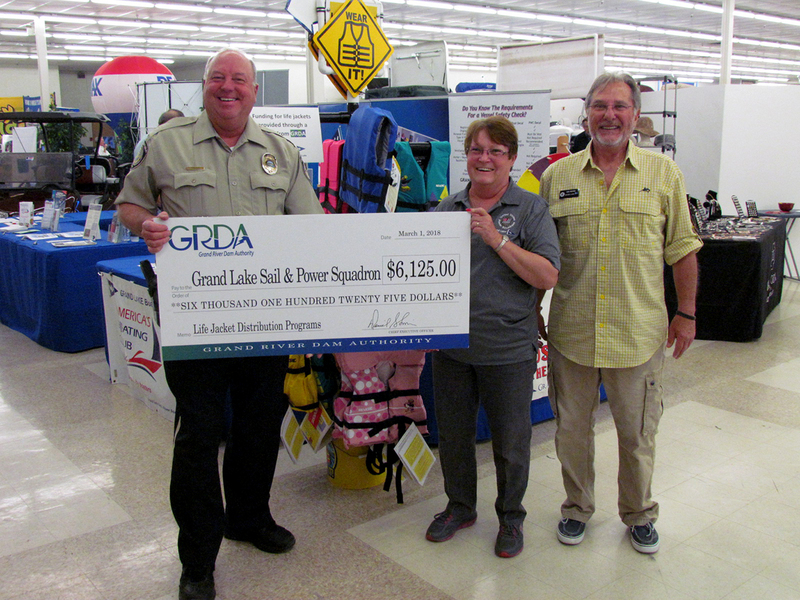 Recently, that commitment was reinforced when GRDA donated funds to continue a long-standing partnership with the Grand Lake Sail and Power Squadron (GLSPS). GRDA Community Relations Officer Ed Ferguson (left) presents a check to Ken Moore, GLSPS Commander and Barbara Zinn, coordinator for the life jacket distribution programs. For many years, GLSPS has been an active advocacy group in the Grand Lake region, promoting boater and water safety through a number of programs. Due to the recent $6,125.00 donation from GRDA, the GLSPS will continue a very important outreach program in 2018; one focused on providing lake users with life jackets. “Safety is the core mission of the GRDA Police, and the programs that the GLSPS conducts to distribute life jackets have a positive impact on our ability to reduce casualties on Oklahoma lakes and rivers,” said GRDA Community Relations Officer Ed Ferguson. Life jackets purchased with those funds will be distributed to lake users through various GLSPS programs and events, added Ferguson. In fact, the first of these give-away programs took place at the recent Grand Lake Boat and Sport Show in Grove, where the GLSPS handed out free life jackets to children. As part of that effort, GLSPS members also ensured the jackets were properly fitted to each recipient. Most importantly, parents were able to leave the show knowing their children had received the most important piece of equipment they would need for any water-related outing. 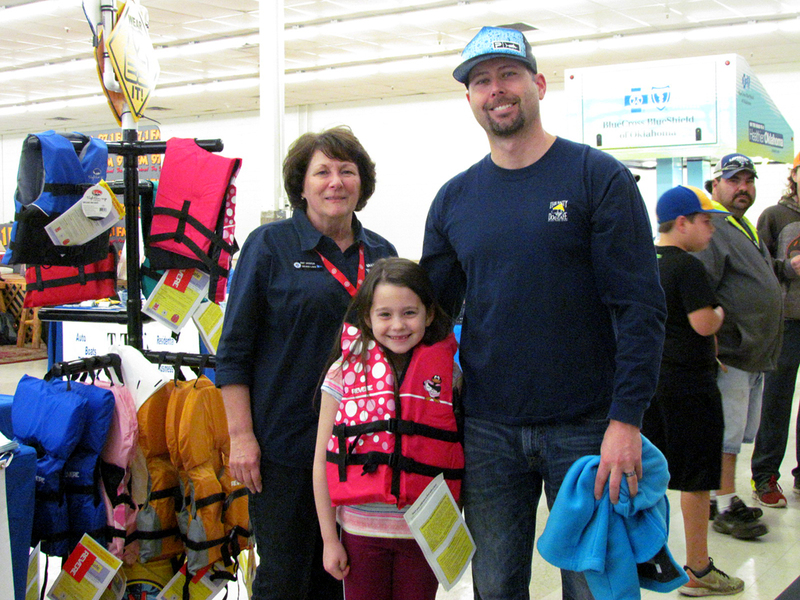 Pat Janiga (left) with the GLSPS made another child and parent happy at the Grand Lake Boat and Sport show in early March by providing the youngster with a new life jacket. The GLSPS will be conducting a similar life jacket distribution program at the South Grand Lake Camp Bandage event on Saturday, June 9th. This free safety fair for families will be held at the Grand Lake RV Resort in Duck Creek (at 31527 S. 4510 Rd., Afton). The public is encourage to attend the event and bring their children, so that GLSPS can continue to provide properly-fitted life jackets, at no charge. 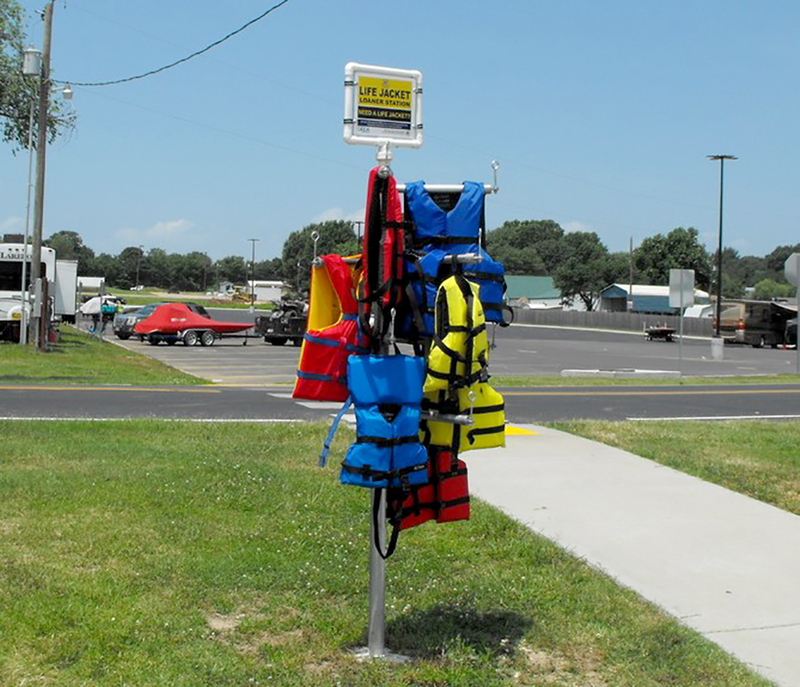 GLSPS stocks a variety of life jackets that can be used by the public at the loaner stations on Grand Lake, such as the one shown at the Wolf Creek Park boat ramp in Grove. around the north Grand Lake area. 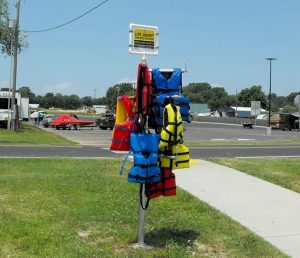 These stations are equipped with various sizes of life jackets for children and adults and allow users to “borrow” a life jacket before they venture out onto the water. Currently, five life jacket stations are located around the lake for public use, these include the Wolf Creek Park boat ramp, Honey Creek State Park boat ramp, Grand Lake State Park boat ramp in Bernice, Twin Bridges State Park boat ramp and the Elk River boat ramp. The GLSPS expects to distribute over 500 life jackets this year as a result of the funds provided by the GRDA. The GRDA Shoreline Cleanup Crew, at work on the waters of Grand Lake. Thanks to a new lake-wide initiative, organized by GRDA, other partners and many volunteers, there is an even greater focus coming to shoreline cleanup efforts around the lake. Langley – Last year, several entities, including the Grand River Dam Authority, Grand Lake Sail & Power Squadron and various grand lake stakeholders came together to develop the “Adopt the Shoreline” Program for Grand Lake. Today, their coordinated effort is set to begin and will bring a new commitment to shoreline preservation and protection along miles and miles of the lake’s scenic shoreline. According to Horton, GRDA realized the real need for an ongoing shoreline cleanup initiative after routine aerial surveys of Grand Lake. While the “Lend A Hand For Lady Grand” program has been successful for many years, this new effort is expected to expand both the reach and volunteer base for cleanup efforts. Horton said the “Lend a Hand for Lady Grand” program will continue to take place annually in addition to the “Adopt the Shoreline” Program. The program works like this: the shoreline is divided into 10 “zones”, with a coordinator for each zone. That coordinator organizes volunteers who work together at set times to clean up their specific zone. GRDA will support the effort by supplying trash bags and will also be paying the disposal costs for all approved program cleanup events. At the same time, GRDA has also staffed its own full-time shoreline cleanup crew, complete with a barge and the necessary equipment to remove large debris form the lake shore. The program will be highlighted by large cleanup events in April and August of each year, although each zone will be able to do their own cleanup efforts at other times as well. Of course, there is always room for more help. If you would like to volunteer or learn more about the effort, you can visit the program’s website at www.grda.com/adopt-the-shoreline, and select the “how to join” tab. You can also contact Horton at (918) 256-0894 for more information. 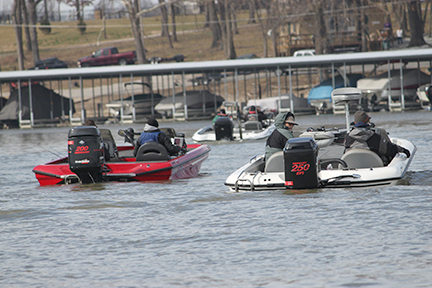 Anglers and spectators on the waters of Grand Lake during the 2016 Bassmaster Classic. Fishing is a popular sport on the lake and the Grand River Dam Authority wants to help educate anglers on proper fish handling techniques. It will do that during a special workshop at the GRDA Ecosystems and Education Center in Langley on February 24. Langley – As the calendar moves towards the busiest part of tournament fishing season, the Grand River Dam Authority wants to remind anglers about proper fish handling techniques. To help accomplish that, GRDA is inviting all area anglers and fishing tournament directors to a special free workshop on Saturday, February 24, at 10AM, at the GRDA Ecosystems and Education Center in Langley. Gilliland, who retired from his position as Assistant Chief of Fisheries with the Oklahoma Department of Wildlife Conservation (ODWC) in 2013, is considered an expert in the field of tournament fish handling. After presenting on these topics, he will also be available to answer questions from participants. “Tournament fishing continues to be one of the most popular activities on GRDA’s Grand and Hudson lakes, so protecting the fishery is a top priority to insure that these tournaments can continue to be successful,” said GRDA Vice President Ecosystems and Watershed Management Dr. Darrell Townsend. Also during the workshops, ODWC Northeast Region Fisheries Supervisor Josh Johnston will be giving a presentation on largemouth bass population dynamics in Oklahoma reservoirs. Johnston will discuss the conditions of these populations using spring electrofishing data collected by ODWC from 2000-2015. This presentation will also include possible ways to improve those populations and feedback on this subject, from workshop participants, is encouraged. For more information on the workshop, contact Janet Dellisanti of the GRDA Ecosystems Management Department at (918) 256-0852 or Officer Jason Littlefield of the GRDA Police Department at (918) 530-6138. Vinita – For the 17th straight year, the Grand River Dam Authority has been recognized for its financial reporting efforts. 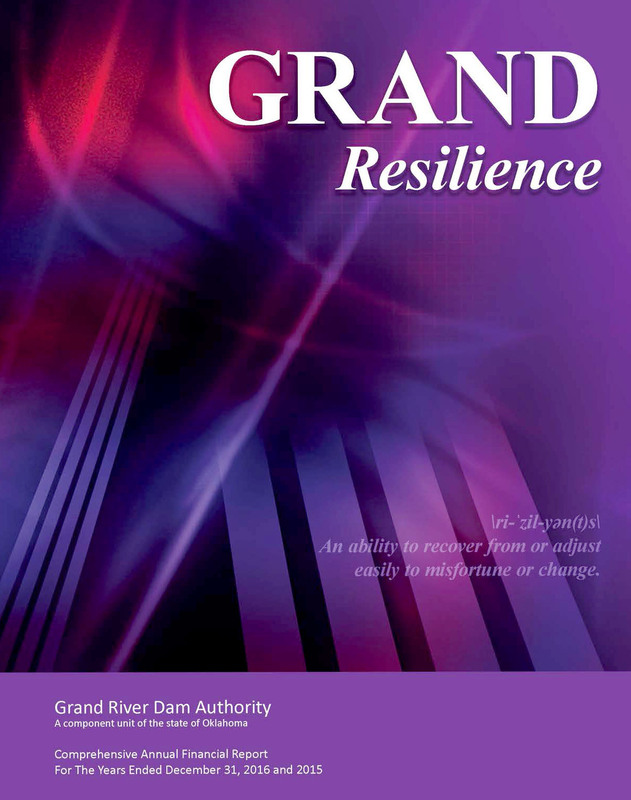 The cover of GRDA’s award-winning 2016 comprehensive annual financial report (CAFR). For the 17th consecutive year, the GRDA CAFR has been recognized for “excellence in financial reporting” by the Government Finance Officers Association of the United States and Canada (GFOA). According to GFOA, the GRDA CAFR was judged by an impartial panel to meet the highest standards of the GFOA program. Further, GFOA determined the GRDA CAFR demonstrated a “spirit of full disclosure” while clearly communicating the Authority’s financial story. 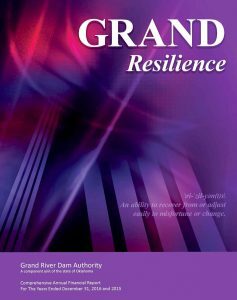 Entitled Grand Resilience, the 2016 GRDA CAFR can be viewed online at grda.com. Headquartered in Chicago, the GFOA is a major professional association servicing the needs of nearly 19,000 appointed and elected local, state and provincial-level government officials and finance practitioners. Passing the leadership baton … Outgoing Grand River Dam Authority board member Steve Spear (right) shakes hands with Wagoner City Superintendent/Public Works Director Dwayne Elam, following the board’s January 10 meeting in Vinita. Elam is replacing Spears as the board’s municipal customer representative. 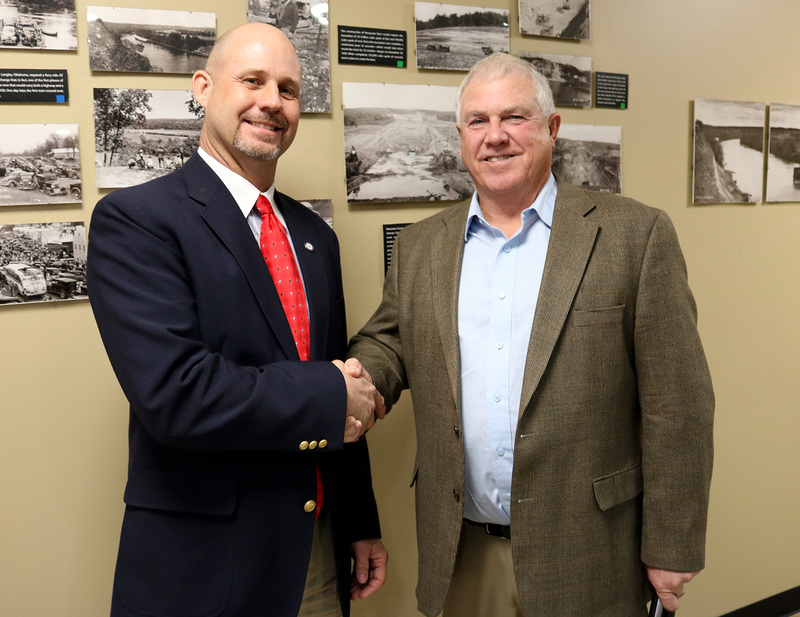 Vinita – Dwayne Elam, city superintendent and public works director in the Grand River Dam Authority municipal customer community of Wagoner, is the newest member of the GRDA Board of Directors. Elam replaces outgoing board member and Cushing City Manager Steve Spears, who retired at the end of 2017. Elam will represent GRDA’s municipal customers as the designee of the Municipal Electric Systems of Oklahoma (MESO). His tenure began at the board’s January 10 meeting, in Vinita. An Oklahoma native, Elam earned a bachelor’s degree in Environmental Science from Northeastern State University (Tahlequah) and holds four Class A licenses from the Oklahoma Department of Environmental Quality. He is a member of the National Registry of Professionals, a member of the MESO Board of Directors and a member of the City Manager Association of Oklahoma. As Wagoner Utilities Director in 2010, he guided the city’s efforts in being awarded the “EPA Region 6 Safe Drinking Water State Revolving Fund Award.” Wagoner was the only Oklahoma community to receive this honor. GRDA is governed by a seven-member board of directors, comprised of representatives from each GRDA customer class (municipals, electric cooperatives and industrials), as well as the GRDA lakes area. Two at-large representatives also sit on the board. Five-year appointments are made by the Oklahoma Governor (3), Speaker of the Oklahoma State House of Representatives and President Pro-Tempore of the Oklahoma State Senate. Two other board positions are ex-officio positions, filled by the general manager of the Oklahoma Association of Electric Cooperatives (OAEC) and executive director of MESO or by their designees. Pryor – The Grand River Dam Authority is increasing its participation to help restore power in the United States Virgin Islands (USVI). 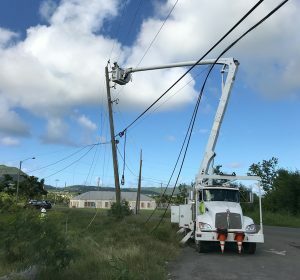 Scenes like this are common across the United States Virgin Islands now as many electric utility crews from the mainland are there, working to make repairs following the damage left by hurricanes last September. This week GRDA is sending 10 employees and eight vehicles to the area to aid in those repairs. Two other GRDA employees have been on site, helping to supervise repair work, since early December. 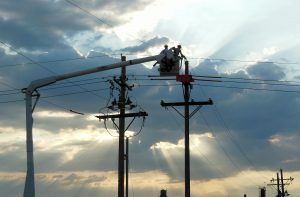 GRDA’s response is part of a nationwide mutual aid effort, coordinated by the American Public Power Association (APPA). Earlier this week, 10 GRDA employees, including electric linemen, mechanics and vegetation management personnel, began the staging process in preparation to travel to the USVI to assist with the ongoing effort to repair the damage left behind by two category 5 hurricanes in September. These employees will join two other GRDA linemen, who have been helping with the effort in the region since the first week of December. GRDA crews are assisting in the USVI as part of a nationwide mutual aid agreement, coordinated by the American Public Power Association (APPA) and the USVI Water and Power Authority. Costs associated with the deployment will be reimbursed by the Federal Emergency Management Agency (FEMA). This latest deployment is not the first time GRDA powerline crews have provided mutual aid following hurricane damage and according to Sullivan, GRDA employees are always willing to volunteer for restoration work when the need arises. GRDA sent men and machinery to Florida after Hurricane Matthew in 2016 and again after Hurricane Irma, earlier this year. In 2005, GRDA personnel also helped restore power in Louisiana following Hurricane Rita. In the USVI, they will join crews from several other mainland utilities in the restoration effort. It is anticipated that GRDA’s crew will be in the USVI a minimum of 30 days. VINITA, OKLA. – November 30, 2017 — The Grand River Dam Authority (GRDA) announced today that it has signed a contract with Google for 140 megawatts (MW) of The Red Dirt Wind Farm. The Red Dirt Wind Farm is a 300-megawatt facility located in Oklahoma’s Kingfisher and Logan counties. Constructed by the project owner and eventual operator, Enel Green Power North America, Inc., the wind farm will be operational by the end of 2017 and will bring GRDA’s total wind generation capacity (combined across several wind farms in Oklahoma) to approximately 385 MW. Once the wind farm comes online, by the end of 2017 the additional capacity will help Google reach its goal of purchasing enough renewable energy to match its energy consumption for global operations. In addition to its power purchase agreement with Red Dirt, GRDA also has a power purchase agreement with the Canadian Hills Wind Farm, near El Reno, Oklahoma. GRDA has been supplying Google’s electricity needs in MAIP since the data center began operations in 2011. Headquartered in Vinita, GRDA is Oklahoma’s state-owned electric utility; fully funded by revenues from electricity and water sales instead of taxes. Each day, GRDA strives to be an “Oklahoma agency of excellence” by focusing on the 5 E’s: electricity, economic development, environmental stewardship, employees and efficiency. 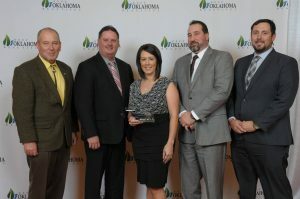 GRDA’s “Rush For Brush” program was the recipient of the Keep Oklahoma Beautiful (KOB) “State Government Program” at the recent KOB Environmental Excellence Celebration. Representing GRDA at the banquet were (from left) Vice President of Scenic Rivers Operations (and new KOB Board Member) Ed Fite; Superintendent of Shoreline Enforcement Scott Horton; Ecosystems Management Administrative Coordinator Jacklyn Jaggars; Vice President of Ecosystems and Lake Management Dr. Darrell Townsend; and Biologist Dustin Browning. (photo courtesy Keep Oklahoma Beautiful). The Grand River Dam Authority’s popular “Rush For Brush” program – established a decade ago to help enhance the fisheries habitat on GRDA lake waters – is the recipient of the 2017 “State Government Program” award, presented by Keep Oklahoma Beautiful (KOB). 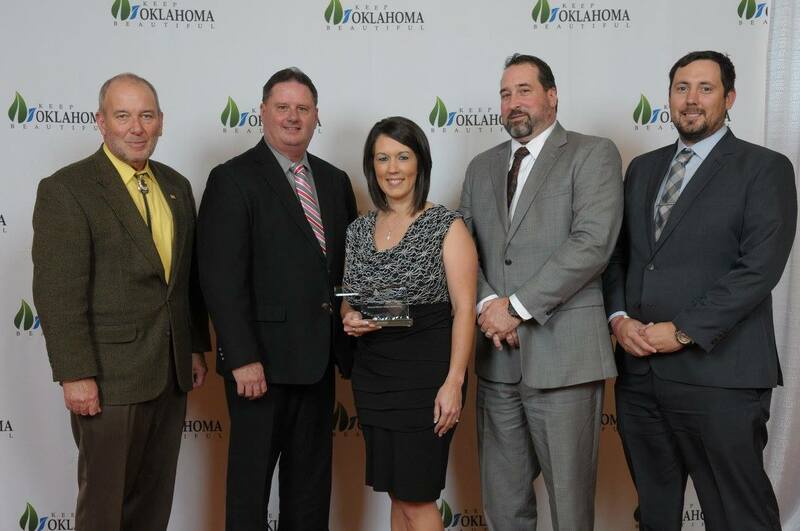 GRDA received the award at the KOB Environmental Excellence Celebration on Saturday, November 17, in Norman. 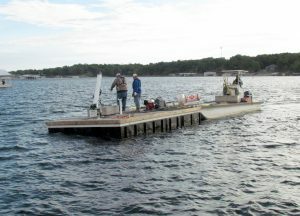 The GRDA Ecosystems Management Department created the program as a way to enhance the fisheries habitat in the waters of Grand Lake, Lake Hudson and the W.R. Holway Reservoir. At annual workshops, GRDA supplies the materials and volunteers supply the labor to help construct these habitats from concrete blocks and PVC pipe. Designed to protect fry and fingerlings in the water, the artificial habitats will stay in place longer than a natural brush pile in the lake. After construction, volunteers take the finished habitats and put them at a location of their choosing in the lake. Since the first workshop in 2007, the program’s popularity and participation has continued to rise. At the same time, the fisheries of GRDA lake waters (as well as the fishing reputation among anglers) has also continued to grow. GRDA Vice President of Ecosystems and Lake Management Dr. Darrell Townsend and GRDA Ecosystems Management Administrative Coordinator Jacklyn Jaggars were on hand to accept the award on behalf of the organization. Also representing GRDA at the event were Vice President of Scenic Rivers Operations Ed Fite (who was named to the KOB Board of Directors earlier this month); GRDA Superintendent of Shoreline Enforcement Scott Horton and GRDA Biologist Dustin Browning.